Brands are smitten. Will Hollywood be, too? With his sandy blond hair, bright blue eyes and shredded physique, Logan Paul could have stepped from Greek lore. The 20-year-old social media megastar who's poised to become a millionaire off goofy videos and silly stunts is, as one might imagine, not short of confidence. "I want to be the biggest entertainer in the world," he says, adding, "I'm a really confident guy." Hate him yet? Hold up, there's a flip side. This real-life incarnation of an animated Disney prince is also equal parts wisecracking clown and unaffected boy next door. He takes repeated potshots to that pretty face for his videos, sharing the results with the social world. He works nearly nonstop, leaves the hard-core partying to others, and sticks close to his Midwestern family roots. Trolls, be warned: slamming Paul would be like punching a puppy. He's just that earnest and adorable. Instead of talking smack, watch where he might go, which, if he has his way, is to mainstream superstardom on the level of his idols, Will Smith and Dwayne Johnson. To call him merely an "Internet star" is woefully inadequate. His pratfall-laden Facebook videos logged more than 300 million views in October alone. For some perspective, that's more than two-and-a-half times the record-breaking number of Super Bowl viewers last year. Still, Paul's got a lot to prove. 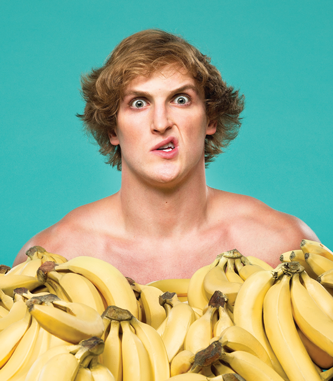 While he's already a massively popular digital influencer—with 20 million-plus fans across Vine, where he initially made his mark, as well as Instagram, Facebook, Snapchat and Twitter—and an in-demand marketing partner, with more than a dozen brand deals to his credit, he is a newbie in the broader entertainment landscape. After all, a few commercials and a guest role on Law & Order: SVU make for a rather skimpy IMDb profile. But could he have a shot at ultimately conquering Hollywood, with his unique mix of brotastic physical humor, sweet-as-pie personality, acting chops (untested as they are) and sheer determination? "I want to be a pioneer," says Paul, after hours of posing for photos for this story in Los Angeles. (Much of that time he spends in his boxer shorts, doing his signature epic splits.) "I want to be one of the first digital stars to make the transition to traditional media." If that sounds like so much bluster, consider that he's got three movies under his belt, including the forthcoming apocalyptic thriller The Thinning from Legendary Digital Media. He's also written his own starring vehicle, Airplane Mode, now fully financed and heading into preproduction. The adult comedy has been described as an American Pie for Gen Z—or as Paul calls it, "an Expendables with Internet stars." On the brand-marketing front, Paul's video for Doritos' "Crash the Super Bowl" campaign, dubbed "Paranormal Snacktivity," was the single most-viewed of 4,500 entries in the contest, though it did not make it to the finalist round of voting. He continues to add to a roster of digital-promo campaigns that includes work for the likes of Hanes, Dunkin' Donuts, Nike, Verizon, Pepsi and HBO. He insists he partners only with those brands he believes in and of which he is already a fan. Though born and raised in the Midwest, Paul has binge-watched enough Entourage to realize he needs to make strategic decisions—and powerful friends—to reach his lofty goal. To that end, last year he signed with Creative Artists Agency, which so far has fielded offers for everything from television to touring to merchandise. 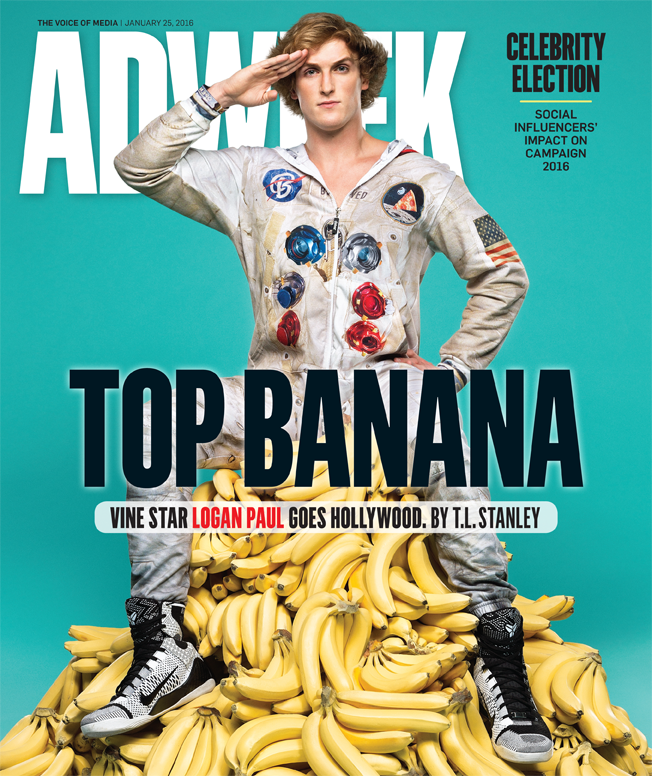 He had already relocated to the epicenter of Hollywood—a hipster apartment complex at the intersection of Hollywood and Vine, as it happens—along with his younger brother and fellow social media star Jake Paul. He is training with drama coaches as well as comedy troupes The Groundlings and Upright Citizens Brigade. Wherever he goes, Paul brings legions of fans who treat him "like the Beatles in the '60s," says Paul Cazers, his agent at CAA, which also reps digital stars like Hayes Grier, Jenna Marbles and Brodie Smith. "He is this generation's teen idol, and every time he presses a button on his phone, millions of people know what he's doing."